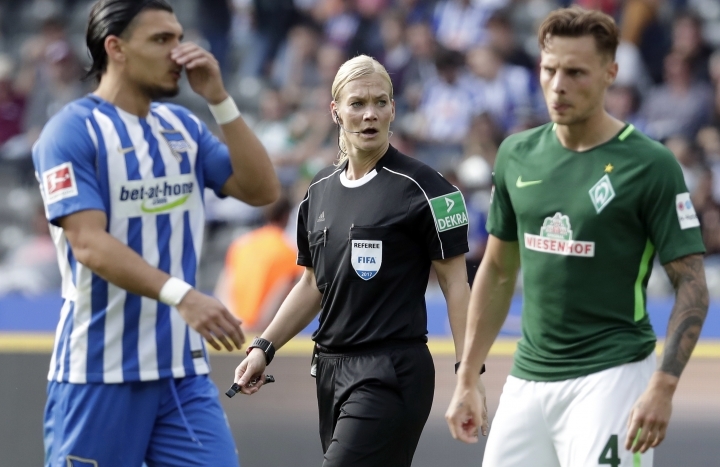 BERLIN — The Bundesliga's first female referee oversaw a 1-1 draw between Hertha Berlin and Werder Bremen on Sunday. 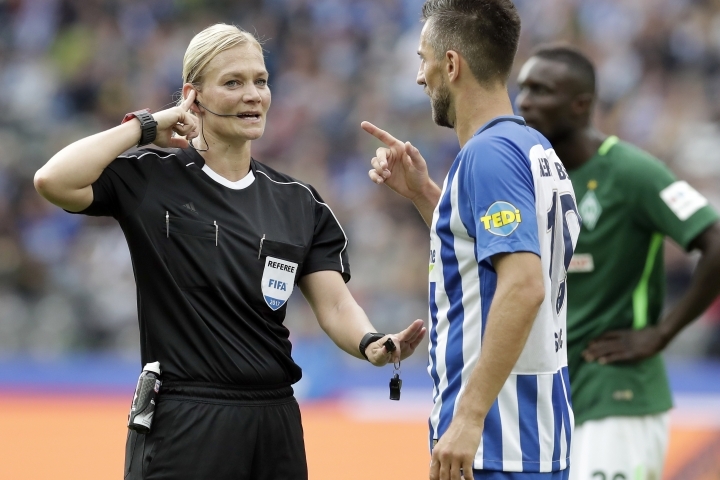 "To be honest I'm relieved that it's over," Bibiana Steinhaus said after her debut in the top flight. "I'm looking forward to a return to normality tomorrow." The occasion was celebrated by the home side with a limited offer of half-price tickets for female supporters. "This was a historical moment," said German soccer federation president Reinhard Grindel, who was among some 50,000 spectators at Berlin's Olympiastadion. "You shouldn't forget that she was under pressure. And to make the right calls with such aplomb is a first-class performance," Grindel added. Steinhaus' performance was also praised by players. "She did well, but that's also no big surprise," Hertha defender Sebastian Langkamp said. Teammate Vedad Ibisevic simply said, "Huge respect." 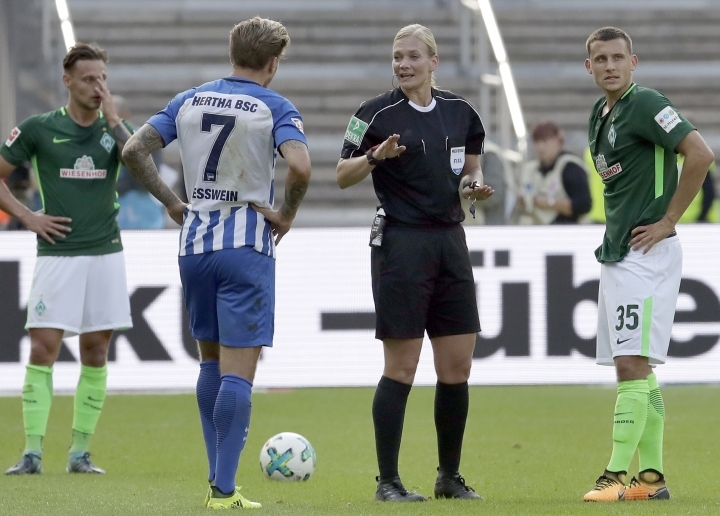 Steinhaus already had a decade's experience of refereeing in Germany's second division after becoming the first female referee in German professional football in 2007. She began by officiating women's games for the DFB in 1999 and became a FIFA referee in 2005. Mathew Leckie put Hertha ahead before the break with a fine shot through Bremen 'keeper Jiri Pavlenka's legs. 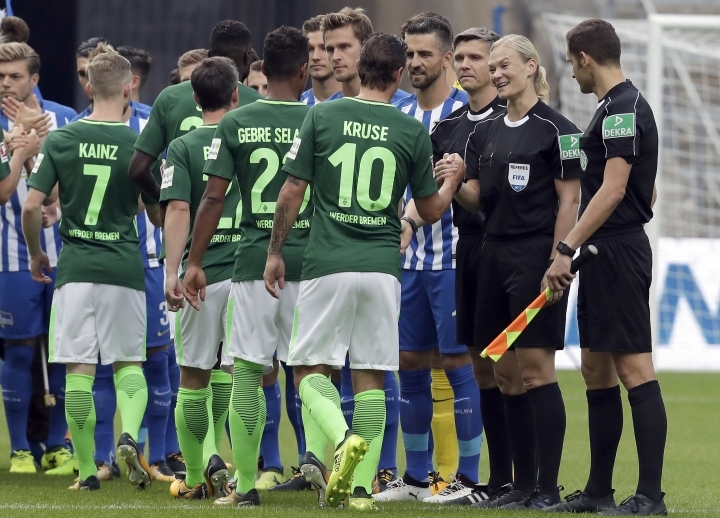 Thomas Delaney equalized after doing well to elude a defender before the hour-mark and Hertha had goalkeeper Rune Jarstein to thank for denying Max Kruse as the visitors grew in confidence. Hertha pushed harder in the final minutes but Ibisevic was denied by Pavlenka before Kruse went close at the other end. Quick-fire goals from Brazilian defender Naldo and Austrian forward Guido Burgstaller after the break helped Schalke to a 3-1 win over promoted Stuttgart in the third round's last game. Nabil Bentaleb converted an early penalty to get the home side off the mark, but Chadrac Akolo equalized for Stuttgart with a brilliant strike from Josip Brekalo's pacy cross. It was just reward for the visitors' 20-minute period of pressure. But Naldo scored on his birthday and then Burgstaller lobbed the goalkeeper to give the home side its second win of the season.